Here is the EMF meter package that gives you everything you need all in one convenient kit. 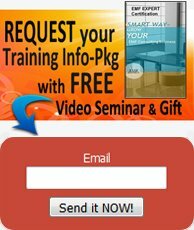 BETTER YET you have the option of buying the kit by itself, or buying it and receiving all the professional training you need to learn how to use them correctly. This is the all inclusive kit for you If you are interested in getting a good workable set of meters that includes everything you will need to train with, and to have ready for an attractive and respectable EMF Consultant start up kit upon graduation, these are the meters, probes and devices that we suggest. We have carefully combed through various manufacturers to find the least expensive devices that provide the most useful tools for EMF Detection and Protection. Although, naturally, these are consumer grade meters, as opposed to EMF industry grade, they are both an excellent starting point AND in the process of using them you will acquire the skills and experience to become an advanced meter user when you are ready for more complex meters (which actually may not even be necessary). This EMF meter package is compiled from the "best in class" devices of various manufacturers, and put into one convenient kit to enable you to measure the most common everyday EMF exposure situations: Electric Fields, Magnetic Fields, Radio/Microwave Fields, Body Voltage, Dirty Electricity and a Faulty Wiring Tester. More details on The EMF Meter Start Up Kit. our EMF Meter Package out of ALL other Choices? The TriField TF2 is a good starter meter to learn on and it holds a prominent place in this EMF meter package for all the many contributions it makes. Although, admittedly you may feel the need for a more complex meter as you advance, but for starters or intermediate users this meter is the "best in class" because it is inexpensive, simple to use and easy to understand. It's accuracy and sensitivity are adequate to detect and measure all the EMF situations that we encounter in everyday life - everything from EMF exposure due to powerlines, to electrical wiring, to any electrical appliance, to wireless devices (Cellphones, celltowers, WiFi, etc) and much more. It's frequency response range allows us to detect what we are dealing with exposure-wise before remediation, and after remediation allows us to confirm that the EMF protection methods we have used, have met the Biologically Based EMF Precautionary Guidelines. All in all an excellent little workhorse meter, not just as a beginner meter but also to serve you as you gain experience by providing a good second opinion for any other more complex meter you acquire as you advance in your meter user skills. Body Voltage is another area of interest that is receiving a lot of press right now, and so officially named 'body voltage meters' are springing onto the market to meet consumer demand. However we wonder why people spend far more money than they need to just to buy a name, when any volt meter can measure any voltage situation, including your body voltage. This handy little multimeter will measure body voltage and a lot more. Dirty Electricity is another example of an area of consumer concern that is receiving a lot of press and so predictably products named for this purpose are leaping into the market. When in actual fact, dirty electricity (or in other words frequencies other than 50 or 60 Hz that electrical wires were designed for) can easily be detected by the change in audio sounds produced by a simple AM Radio as it 'reads the air' for radio signals. Nothing could be simpler. For our kit we've chosen an inexpensive solar powered AM radio (with a backup hand-crank feature) to serve double duty as an EMF meter and as a Emergency Broadcast radio in case of disaster. This device makes a very useful contribution to this EMF meter package, since it is used for measuring the level of "noise" (unwanted frequencies that piggyback on the wiring in your home by technology devices that are plugged into that line, which electrical lines were never intended nor designed to carry). Again, relying on good old engineering smarts, no expensive dirty electricity meters or filters are needed to detect or solve 'dirt' on your electrical wiring, or to measure the magnetic field we are routinely exposed to, which is being produced by the electrical wiring in our walls that surrounds us, not unlike an electrical fence. We've found that a great deal of the magnetic fields produced by electrical lines of your home (office etc) is needlessly present on the line due to faulty wiring, which can be revealed with a simple device that plugs into any AC electrical receptacle and tests the wiring to confirm that the wiring has been installed correctly. This little device definitely pulls its weight in this EMF meter package, and has often saved hundred/thousands of dollars in unnecessary EMF remediation. Important Protection for Instruments. 17 inches long, with metal hinges and parts, metalized sides, and foam inserts. Mainly designed to protect your instruments, this attractive case also provides you with the convenience of having everything you need right at your fingertips, and project a professional EMF Consultant image at the same. Please Note: Some items in this EMF meter package may not be consistently available as pictured (color, materials, brand names etc may go in and out of stock), however if replacements must be made, they will offer the same functionality and be of equal or greater value. 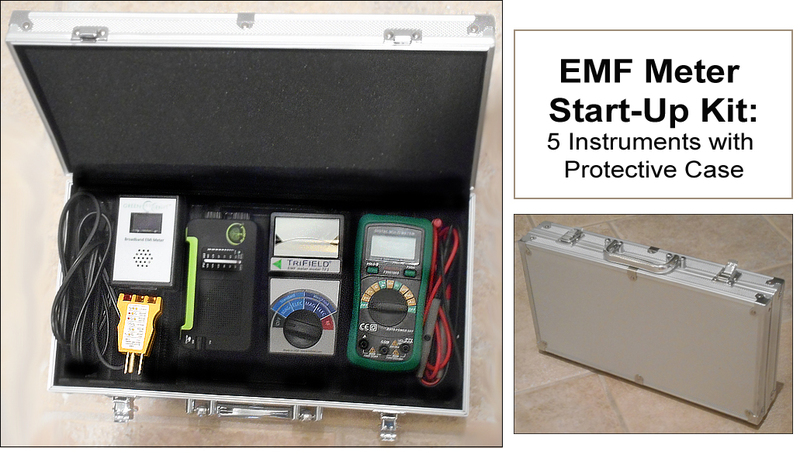 includes a collection of five EMF Meter instruments with a protective carrying case. Includes all manufacture's user info. This collection represents a substantial savings (an estimated $200 - $300 savings) to you in both money and time compared to higher priced instruments (that offer less meter for the money) which are sold and shipped separately, and since this collection was compiled and tested by a professional electrical engineer (offering you tried and true EMF detection instruments) to save you days of comparison shopping, needless expense, and disappointing product returns. Need a More Advanced EMF Meter Package? Contact Us, for a quick phone consultation to discuss what types of meters would best serve your situation with your EMF detection and protection needs in mind, and thus make the best 'next step' for you in adding to your growing meter collection. FULL DISCLOSURE: 100% of any commission that is earned from the sale of products discussed during training, or posted on our site or newsletter, goes towards subsidizing the tuition costs of EMF Experts Consultant Certification training for EHS people who now must find new careers working from home, while regaining their health and rebuilding their lives in the process. Spaces are reserved in every training course for EHS students and/or their caretaker; more information is available about this certification training in our EMF Consultant Certification Training Info Packet. EMF Experts Start Up Meter Kits are a collection of meters from various manufacturers compiled in one convenient kit by EMF Experts. Each product is tested by us before going into the kit to ensure its good working order, however its warranty is also limited to whatever that manufacturer's warranty is and so the customer will deal directly with that manufacturer should any problem arise.